Dennis Ferrer is one of King Street's most talented and sought after artists, something we recognised by giving him his very first UK cover in a previous role. 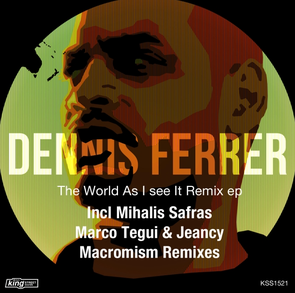 With a celebrated back catalogue containing some of house music's most popular hits, the label now gets set to release Dennis' ‘The World As I See It Remix EP’ showcasing some of the hottest remixes ever done for the US DJ/producer. Italian DJ/production duo Macromism kicks things off with their big room techno remix for ‘Transitions’, followed by Greek house music DJ Mihalis Safras, who also delivers a techno remix of ‘Transitions’. Safras follows up with a banging deep tech remix of Ferrer's original mix ‘Destination’. Finally, Marco Tegui & Jeancy complete the release with their melodic remix of the wonderful ‘How Do I Let Go’, which features the beautiful vocals of the late K.T. Brooks.